Hi Hope I can get some help with this please back in 2016 I had an alleged debt of £1595.23 with O/C. This was passed to Robinson way and I did the three letter process. This then resulted in them sending me a letter stating they have sent the debt back to O/C. A while latter I had a letter from another D/C and again I completed the three letter process and heard no more. 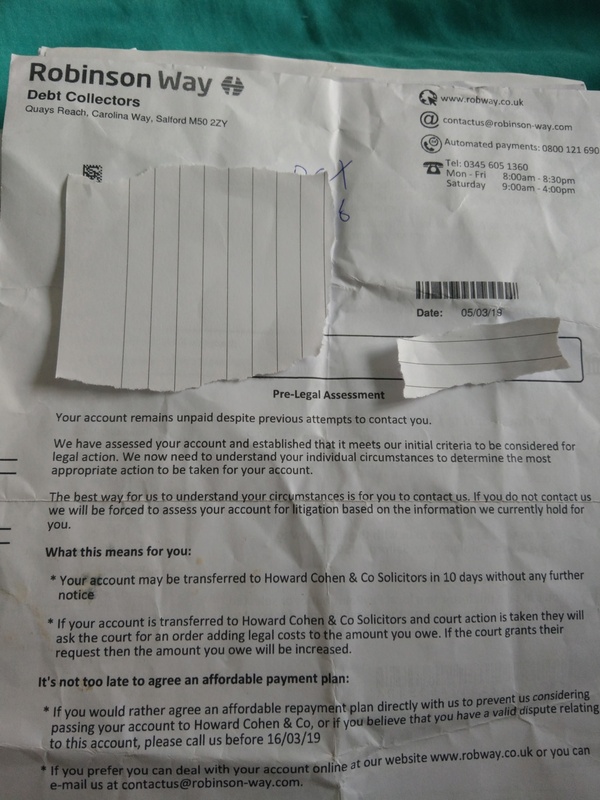 This month I received a letter from Robinson Way stating that if I dont contact them in 14 days my account will be to Howard Cohen and CO for legal action. I contacted Robinson Way and told them they had sent a letter stating debt had gone back to O/C. All they said was they received this debt again in October 18. (this account has a different ref no from when they first had it) I told them I was going to dispute the debt and my account is on hold while I respond to them. I need to know how I should go foward, Do I just do the 3 letters again? it may be a different reference number but the a/c number should be the same, check that out too. do you recall the last time you made a payment to anyone for this debt ? The account number, which is the O/C credit card number is the same on both letters. Non of the letters say if it has been sold to them or if they are an agent. I have requested this information from them. The last payment was in 2015 to the O/C no payments have ever been made to the DCAs, uploaded the letters if that helps. Thanks for your quick responsr it is much appreciated. are they acting for the original creditor ? are they now acting for a DCA who have purchased the debt ? or are they themselves alleging to be the owner of the debt ? i would write a simple letter to them asking them to verify their standing in this matter so that you are able to make an in formed decision on how do deal with this. Until you are in receipt of this information it would be impossible for you to make an informed decision on how to proceed. that is what i would do and indeed have done in the past. 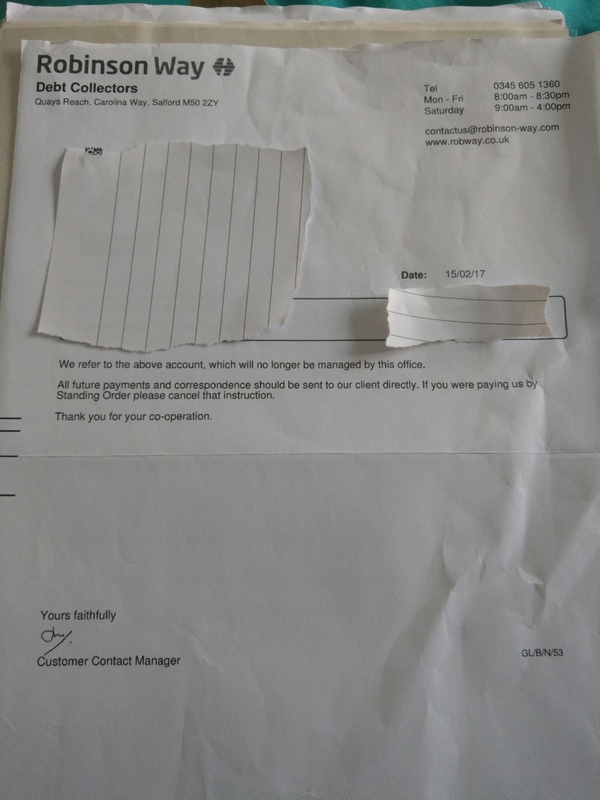 Thank you so much for your help I will fire off a letter to them and post back the reply. Peace to all. We can confirm that this account relates to CC account, which was opened 2012 and defaulted 2015. The last payment received by the original creditor was 2015. Robinson Way received this account October 2018 and are servicing the account on behalf of Hoist Finance UK Holdings 3 Ltd who are the legal owners of the debt after purchasing it from O/C. In the absence of any further queries, we would now require you to contact us with your payment proposals towards this account. To assist you with this, please complete and return the attached financial statement. Alternatively, you can visit www.robway.co.uk and complete a financial statement (use My Account and Offer Options). so we now know that hoist have bought the debt. personally i would send a SAR off to the OC to see what they have, do you yourself have any original paperwork ? the information is for you only, defaulted in march 2015 but no default notice until a year later ? i would like to see the default notices if poss, if you wish to keep it off the main site you could put it in a PM ? OK thanks so here are the letters, sorry I didnt read one fully so I have only one actual default letter I think. I also found the account on a different credit report from the one I normally send please see below. Dont know if it helps but it shows account settled. Just thought I would post it anyway. I will get the SAR sent off to O/C. thank you for your continued help it is appreciated.